Manchester City manager Roberto Mancini in Beijing today. ROBERTO MANCINI SAID today he was not in charge of transfers, after British media reported club officials were blocking his attempts to sign Arsenal captain Robin van Persie. Reports suggest that bosses at City are attempting to scale back the club’s huge squad, ahead of new rules to be introduced by European football’s governing body in the next two years. The Premier League champions are owned by Sheikh Mansour, a member of Abu Dhabi’s ruling Al-Nahyan family, and are one of the richest clubs in the world. Mancini may be forced to sell another striker to balance the club’s bulging wage bill before he can move for Van Persie, reports in Britain claim. Van Persie has told Arsenal he will not be extending his contract with the north London club past the end of the forthcoming season. Mancini refused to say if he was any nearer signing the player, but said he was one of the Dutch striker’s admirers. “It is difficult to say this at this moment because Van Persie is an Arsenal player and he is not our player,” Mancini said. ”We know that Van Persie is a fantastic striker, but we have four strikers and with these strikers we won the Championship last year. City have announced that captain Vincent Kompany has signed a new six-year contract with the club. The Manchester side face Arsenal on Friday in Beijing’s Bird’s Nest Stadium — the main venue for the 2008 Olympics. Email “I'll have to ask my supervisor: Mancini says he's not in charge of transfers”. 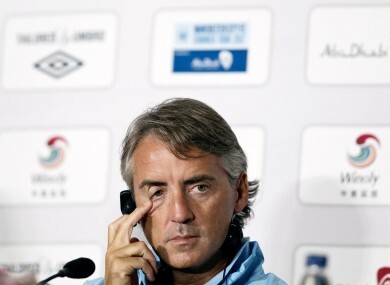 Feedback on “I'll have to ask my supervisor: Mancini says he's not in charge of transfers”.